Gardai will not be issuing cycling on-the-spot fines for not using bicycle helmets or high-vis, the Garda press office confirmed this afternoon. We asked for confirmation of this after an official Garda account on Twitter posted an image which was described as confusing by many members of the public. Legislation would have to be changed for such fines and successive ministers for transport, including the current one, have stated that there is no plan for such a change. Sergeant Brian Whelan of the Garda press office told IrishCycle.com that the inclusion of helmets and high-vis in the image tweeted by the official Garda Traffic Twitter account was just to show safe cycling. He said the finable offenses are covered by the text below the image, and confirmed none of these, not even cycling without due reasonable consideration, includes the wearing of helmets or high-vis. Another user, Ian Murphy tweets: “@GardaTraffic poster insinuates items pictured are required. Extremely poorly produced poster. Should not be endorsed by AGS. @RSAIreland”. Another example, from a user called Jim, asks: “Can @Paschald clarify that image on @GardaTraffic poster does NOT relate 2 newly introduced FCPN’s? @IrishCycle https://t.co/yOjPegtbHP”. It’s such a terrible poster on several levels. Were you in touch with the RSA? I’m awaiting a response on the misleading nature of it all. It’s what we can expect from the RSA. The conclusions they draw from surveys are tenuous, their advice is poor and often inaccurate. I have little confidence in that organisation, it needs an overhaul and a change in leadership. Leaving aside whether the helmet / fluorescent top is in / out, what is the difference between item 4 and item 7. Does anyone know the difference between a red lamp that is lit and a red lamp that is illuminated? 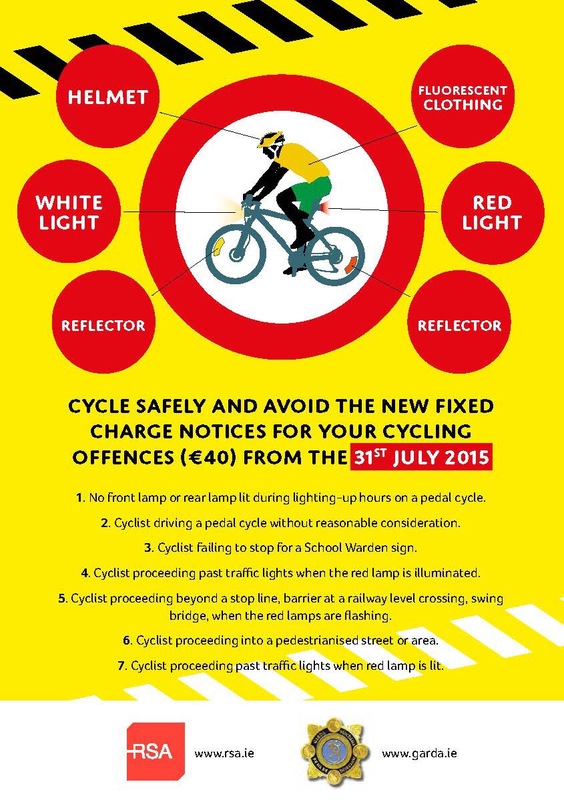 They’ve also made a mistake in no.7- it should read ‘cycle traffic lights’, not just ‘traffic lights’. The text of no.4 and no.7 as included in the poster are identical, except for the synonymous ‘lit’ and ‘illuminated’. It’s an error, one of those should refer to ‘cycle’ or bicycle traffic lights as used on a limited amount of cycle routes. Cian…..Garda Brian Whelan.has obviously NOT read the legislation! There is NO REQUIREMENT to have a front reflector!! This Press Release/Tweet is a Joke! Not properly checked, misleading etc! Garda office need to redact/withdraw this post! What is the difference between offence No.4 and 7?? .. And agreed on the poster! Vague and misleading..